Prior to becoming a physician, Dr. Todd Foster Huzar served as a volunteer firefighter for nine years and as an EMT for three years on Long Island in New York. Dr. Huzar went on to receive his medical degree from St. George's University School of Medicine in Grenada, West Indies. He then completed his general surgery internship and residency with Weill Cornell Medicine at New York Methodist Hospital, currently known as New York-Presbyterian Brooklyn Methodist Hospital, in Brooklyn, New York. 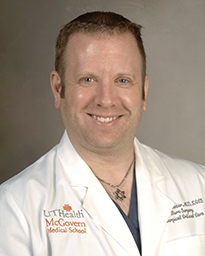 He completed his burn fellowship at U.S. Brooke Army Medical Center’s Army Institute of Surgical Research in San Antonio, Texas, and a surgical critical care fellowship at McGovern Medical School at UTHealth in Houston. Board certified in general surgery and surgical critical care, Dr. Huzar treats patients for management of acute burn injuries. Patients appreciate Dr. Huzar’s attention to detail and excellent bedside manner. Dr. Huzar believes that an important aspect of caring for his patients and their family members involves taking the time to talk with them about their treatments. Dr. Huzar is the director of pediatric burn surgery at Children’s Memorial Hermann Hospital and is an assistant professor of the Department of Surgery at McGovern Medical School. Throughout his career, Dr. Huzar has been honored with numerous awards, including McGovern Medical School’s 2016-2017 Dean’s Teaching Excellence Award and The Amos House of Faith’s 2017 Burn Surgeon with Best Bedside Manner. He serves as a fellow of the American College of Surgeons and a deputy chairman of the American Burn Association’s Ethics Committee. In addition, he is a member of the Association for Academic Surgery, the International Society for Burn Injury and the Society of Critical Care Medicine. In his free time, Dr. Huzar enjoys spending time with his two children and eating at new restaurants. The after care for a burn is very important for your child’s recovery. The Children’s Memorial Hermann Hospital burn care video provides patients and families with visual instruction on best practices for cleaning, treating and caring for a burn wound. Please watch the instructional video below to learn how you and your child can participate in your child’s healthy healing.